Few days ago in The Economist’s blog was posted a comment regarding the issue of the wealth inequalities in the world. In the comment was mentioned the last book written by the Nobel Prize in Economics in 2001 Joseph E. Stiglitz: “The Price of Inequality: How Today’s Divided Society Endangers Our Future“. Inequality is an actual topic especially considering the differences between the level of development of the economies and wealth in the world and the unbalance in terms of net exports and public debt between the emerging markets and the developed economies (see also The importance of balance and the idea of a sustainable growth). Joseph E. Stiglitz, together with George A. Akerlof and A. Michael Spence, won the most famous and prestigious award price in Economic Science thanks to their analyses of markets with asymmetric information. Knowing that, suddenly came into my mind the relationship between differences (inequalities) and the concept of entropy. Why? Because entropy is a measure of the level of disorder of a system and the information within the system is fully distributed when the level of entropy (disorder) is highest. Think at a glass of pure water taken from a fresh mountain spring and a drop of a good red wine. Since the water and the red wine are separated the level of disorder is low and the entropy as well. Furthermore, since it possible from an external observer to clearly distinguish between them, it is also provided an information: there is a clear water and there is drop of red wine, nice and easy. Then, imagine to let the drop of red wine fall into the water: what will you see? 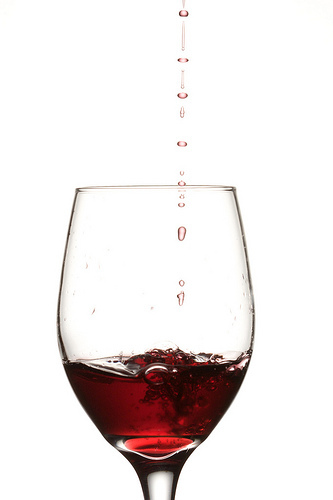 There will be a transition phase in which the drop of wine expand itself and the water become less and less clear. At the end of the process the water it’s not so pure as a mointain spring and the drop of red wine is widespread and uniformly distributed so that the maximum level of disorder (entropy) has been reached and the information (red wine and clear water) is not available anymore from an external observer. Time for a recap – entropy and information are related together: a high entropy means that the information is widespread and fully available within the system while a low entropy means that the information is ordered and organized and thus not fully available within the system. Now, how entropy and cost of inequalities are correlated one to another? Well, let’s consider again the glass of water polluted with a drop of red wine. How should be the drop of wine separated again from the water? By looking at the tools available in the Chemistry Set, there are many techniques: centrifuge, stills and so on. However, these techniques, despite they are different, have common pattern: they need energy and where some energy is required there is always a cost and resources used! For the same reason, thinking about the transition phase of the process, in order to avoid that the drop of wine spreads over, a counteraction is required: barriers, centrifuge as well and whatever any chemist’s tool can provide. As far as I understand from the reasoning of Joseph E. Stiglitz, to a polarized information correspond a polarized distribution of wealth as well. A polarized distribution of wealth means having inequalities that have a cost in terms of: inefficient use of resources (environment, labour,…), political insabilities and even unbalanced prices and rate of return in the stock market because an enclosed information let more space for speculation rather than for investments. Just think what’s going on with the public debt crisis in the Euro zone. Considering the example of the water and the drop of wine described above, Is it possible to infer that behind the cost of inequalities mentioned by Joseph E. Stiglitz there is the second law of thermodynamics? (Entropy). Since is sill more probable and easier to pollute the water rather than clean it or is not still possible to remember the future and forget the past (see also A Brief History of Time by Stephen Hawking) the second law of thermodynamics hasn’t been contradicted yet. Acknowledged that equality doesn’t mean fairness, how can be possible to measure the inequalities that can be tollerated by applying entropy to economic and society sciences in general? Let’s think about it sitting in front a good red wine! This entry was posted in Economy, Leisure, Funny stories, Miscellaneous, Physic and tagged asymmetry, cost, economy, entropy, inequalities, Information Theory, Stiglitz by ivangruer. Bookmark the permalink.